Emma Cale has been writing professionally since 2000. Her work has appeared in “NOW Magazine,” “HOUR Magazine” and the “Globe and Mail.” Cale holds a Bachelor of Arts in English from the University of Windsor and advanced writing certificates from the Canadian Film Centre and the National Theatre School of Canada. Sweet potatoes are a good food choice for diabetics as they are high in fiber and have a low glycemic index. Foods with a low glycemic index have less of an immediate impact on blood glucose levels, and therefore can help diabetics control their blood sugar. 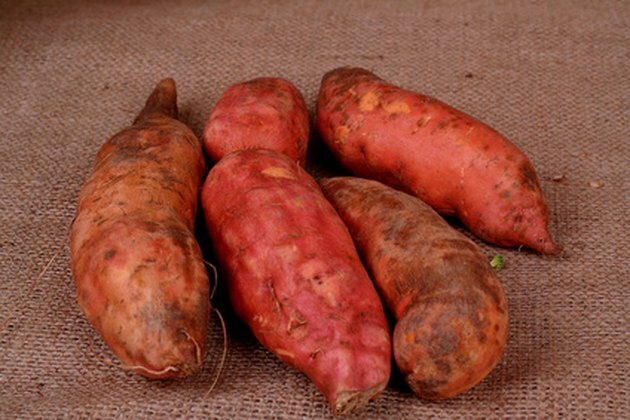 The method used to cook sweet potatoes will affect their glycemic index; certain cooking methods spike the glycemic index of sweet potatoes and render them less desirable for diabetics. The glycemic index measures how carbohydrates affect blood sugar. The system was developed by University of Toronto professor Dr. David J. Jenkins in an effort to determine which food best serves the needs of diabetics. The index tracks the rate at which carbohydrates are absorbed into the blood after digestion. The lower the glycemic index of a food, the better it is for diabetics, since it can help them avoid high blood sugar levels and possible diabetes complications. Sweet potatoes have a glycemic index of 44 – foods considered low on the glycemic index are 55 and less – so they are good for diabetics. Caiapo is the extract of a Japanese-grown white variety of sweet potato that is sold as a treatment for diabetes in that country. According to a 2004 study led by University of Vienna associate professor Dr. Berhhard Ludvik and published in the journal "Diabetes Care," type 2 diabetic patients treated with caiapo saw significant decreases in fasting blood glucose levels and overall improvement in glucose control. The researchers concluded that the white sweet potato extract caiapo is good for diabetics as it can help them manage their condition. Sweet potatoes are also good for diabetics because they contain a good deal of fiber, particularly when the skins are left on. The amount of fiber in a food slows down the rate of digestion of the starches. This action in turn lowers the glycemic index of the sweet potato and helps keep blood sugar levels within a manageable range. Tooking method you use will affect the glycemic index of a sweet potato. For diabetics, certain cooking methods are more conducive to managing blood sugar levels. Boiled or mashed sweet potatoes, for instance, are not recommended as they are digested faster, thus increasing their glycemic index and possibly causing blood sugar levels to spike. Similar to fiber, fat will slow the rate of digestion and therefore maintain the low glycemic index, so a cooking method for sweet potatoes that is good for diabetics is sautéing in oil with the skins on. "Diabetes Care"; Efficacy of Ipomoea Batatas (Caiapo) on Diabetes Control in Type 2 Diabetic Subjects Treated with Diet; B Ludvik et al. ; February 2004 .